The painting, Landscape, by Don A. 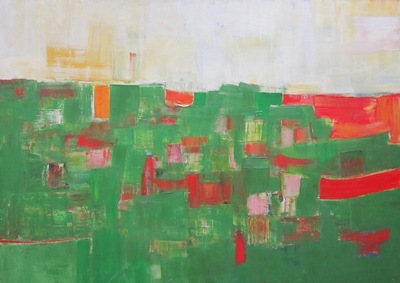 Pace of Fort Wayne, Indiana, relates to abstract expressionist modes that prevailed during the mid-twentieth century. The painting combines aspects of a recognizable subject (landscape) with abstract forms. Roughly structured rectangular shapes that emerge within the composition descend from earlier post-impressionist landscapes by Paul Cezanne.